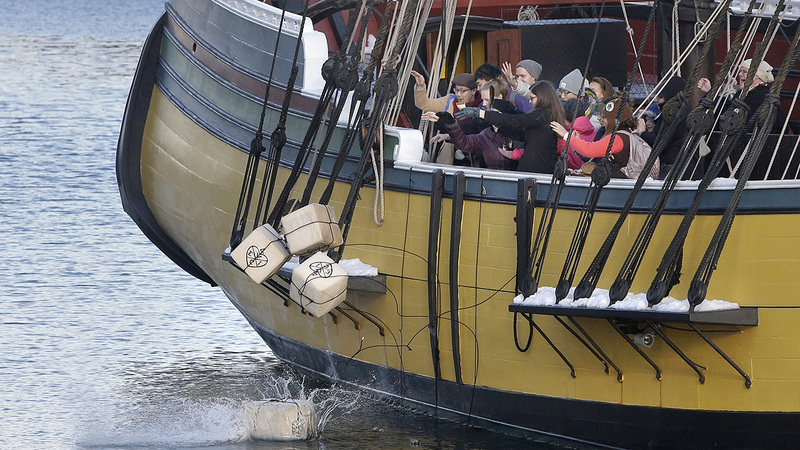 BOSTON -- Tea will once again be thrown into Boston Harbor to mark the 245th anniversary of the Boston Tea Party. Sunday is the anniversary of the protest during which colonists protesting taxation without representation threw British tea into Boston Harbor in what is considered a pivotal event that led to the American Revolution. The Old South Meeting House and the Boston Tea Party Ships and Museum are organizing the reenactment. It will feature more than 40 grates of loose tea was sent in from across the country to be thrown into the harbor as part of the event. Organizers are expecting thousands of spectators at the annual event, which will shut down streets Sunday night in Boston. Shawn Ford, executive director for the Boston Tea Party Ships and Museum, said it's important to mark the anniversary because it was the "single most important event that led to the American Revolution." "Simply put, if the Tea Party didn't happen, we could be British today," he said. "The citizens of Boston stood up and were willing to risk their lives, families, homes and fortunes based on this idea that men of this country should be free from taxation without representation." He said the destruction of tea in Boston "changed the world." Harriet Cross, the British consul general to New England, will welcome attendees to celebrate the current relationship between Boston and the United Kingdom.